Homemade pizza is such a fun and easy weeknight meal, but also doubles as a great party food. Tonight, Mike and I had this plum tomato pizza for dinner with a caesar salad, but just by cutting the pizza into bite size pieces transforms it into a quick and delicious hors d'oeuvre. I love using canned plum tomatoes because they have such robust flavor, you can skip the pizza sauce! I will admit that I find pizza dough incredibly frustrating to work with. I've tried rolling it, tossing it, pulling it....but the most effective method i've found thus far is delegating this responsibility to Mike! He uses his fingers to press the dough out into the shape of the pan - his patience is our pizza night virtue! Preheat oven to 425 (if you are using a canned pizza dough, use the provided instructions). Drizzle olive oil onto a sheet pan and use your fingers to spread the dough out within the pan. Transfer the pan to the oven and bake for 5 minutes. Meanwhile, use your hands to break apart the tomatoes into thinner pieces; set aside. After five minutes, remove the dough from the oven and top with plum tomatoes (let any excess liquid drip off first), mozzarella cheese, parmesan cheese, and italian seasonings. 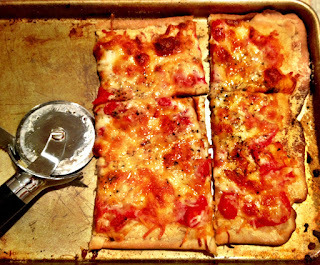 Return pizza to the oven and continue to bake until cheese is bubbly and crust is cooked through. Cut into squares and serve.